Objectives We aimed to evaluate the effects of methotrexate (MTX) comedication added to biological disease-modifying antirheumatic drugs (bDMARD) on disease activity measures in patients with rheumatoid arthritis (RA) in routine care. Methods Patients with RA on treatment with either bDMARDs or conventional synthetic DMARDs were included in this prospective cohort study. The effect of (time-varying) combination therapy with bDMARD and MTX compared with bDMARD monotherapy was tested in longitudinal generalised estimating equation models using as outcomes: (1) the likelihood to be in remission according to the 28-joint Disease Activity Score (DAS28) erythrocyte sedimentation rate (ESR) (<2.6) and to the Routine Assessment of Patient Index Data 3 (RAPID3) (0–30; ≤3), a patient-reported outcome measure about RA symptoms; and (2) DAS28-ESR and RAPID3 as continuous variables. All models were adjusted for potential confounders: age, gender, drugs for comorbidities (yes/no), oral steroids (yes/no) and non-steroidal anti-inflammatory drug (yes/no). Results In total, 330 patients were included (mean (SD) follow-up; 10.7 (9.7) months). Compared with bDMARD monotherapy, MTX combination therapy was significantly associated with a 55% higher likelihood to be in DAS28 remission, but not RAPID3 remission, over time. Combination therapy resulted in slightly, but statistically significant, lower levels of DAS28-ESR over time (β=−0.42 (95% CI −0.67 to − 0.17)), but not RAPID3 (β=−0.58 (95% CI −0.65 to 0.49)). The effect on DAS28-ESR was entirely explained by lower swollen joint counts and was persistent after correction for confounders. Randomised controlled clinical trials have already shown that the concomitant use of methotrexate (MTX) in patients with rheumatoid arthritis (RA) on biologics is more efficient compared with monotherapy with biologics. Observational studies in RA investigating the added value of concomitant MTX over monotherapy with biologicals are scarce and yield contradictory conclusions. This study adds to the knowledge that cotreatment with MTX in routine care patients with RA treated with biologicals lowers 28-joint Disease Activity Score (DAS28) over time and improves the likelihood to be in DAS28 remission. Benefits were detected in non-patient-reported disease aspects like the swollen joint count instead of patient-reported aspects of the Routine Assessment of Patient Index Data 3(RAPID3). By demonstrating the clinical significance of concomitant MTX use in routine care patients with RA, rheumatologists are helped with motivating patients to continue to use MTX combined with a biological in accordance with the treatment guidelines. Still, there is evidence that many rheumatologists do not adhere to a strategy of MTX added to bDMARD in daily clinical practice.5 6 There are several reasons to explain non-adherence, such as poor tolerability and emerging contraindications,6 7 but this points to a discrepancy between clinical trials and usual practice. In fact, while RCT data on the efficacy of MTX added to bDMARD therapy are convincingly positive, evidence of such an effect in daily clinical practice is still scarce. A few observational studies tried to bridge the findings in real-world clinical practice and RCTs on the efficacy data of bDMARDs in general.8–12 Thus far, observational research has yielded conflicting results regarding the possible added benefits of MTX on patients receiving bDMARDs and studies using longitudinal data are lacking.9 12 In this study, we aimed to evaluate the longitudinal effect of combining MTX with bDMARDs on disease activity measures over time in patients with RA from daily clinical practice. Consecutive adult patients with a clinical diagnosis of RA according to their treating rheumatologist that also fulfilled the ACR 1987 classification criteria13 were treated with conventional synthetic DMARD and/or bDMARDs. These patients were included in this prospective observational study that was executed in a large rheumatology centre in the Netherlands between April 2013 and April 2016. The local medical ethics committee reviewed and approved the study protocol. All patients provided informed consent before inclusion and were treated according to the routine care schedule. The effect of combination treatment with MTX and bDMARDs as compared with bDMARD monotherapy on disease activity measures over time was tested in longitudinal linear/binomial (depending on the outcome) generalised estimating equation models with both the treatment and the outcome modelled as time-varying variables. Treatment was added to the models as a ‘dummy’ variable reflecting the four options encountered in clinical practice: (1) bDMARD+MTX; (2) bDMARD alone (reference); (3) MTX alone; and (4) none, but analyses focused on the comparison of interest (ie, combination treatment vs bDMARD monotherapy). The exchangeable ‘working’ correlation structure was used to take into account the repeated measures over time within patients. Disease activity was modelled in three complementary ways: (1) DAS28 and RAPID3 as continuous variables; (2) DAS28 and RAPID3 as binary definitions of remission (ie, <2.6 and ≤3, respectively); and (3) individual DAS28 components: that is, TJC (0–28), SJC (0–28), PGA (0–10) and ESR (mm/hour) as continuous variables. The effects of treatment on each outcome were tested in separate models, first with no adjustment (‘crude model’), and second after adjustment for variables a priori selected on clinical grounds as potential confounders (age (years), gender, use of drugs for comorbidities (yes/no), oral glucocorticoids (yes/no) and use of non-steroidal anti-inflammatory drugs (NSAID; yes/no)). Variables that vary over time (eg, treatment with NSAIDs) were modelled as such. All analyses were done with Stata V.15. In total, 330 patients (1348 visits) were included. Overall, the mean (SD) follow-up time was 10.7 (9.7) months. The mean (SD) overall disease duration at baseline was 11.2 (9.6) years and failure of at least one previous bDMARD occurred in 20% of the patients. Patients on MTX comedication, compared with patients not on MTX, had at baseline lower mean DAS28-ESR (3.1 (1.3) with MTX vs 3.5 (1.4) without MTX; p=0.001) and lower RAPID3 scores (10.1 (6.2) with MTX vs 12.6 (6.0) without MTX; p<0.001). Other demographic and disease characteristics comparing the two groups are described in table 1. 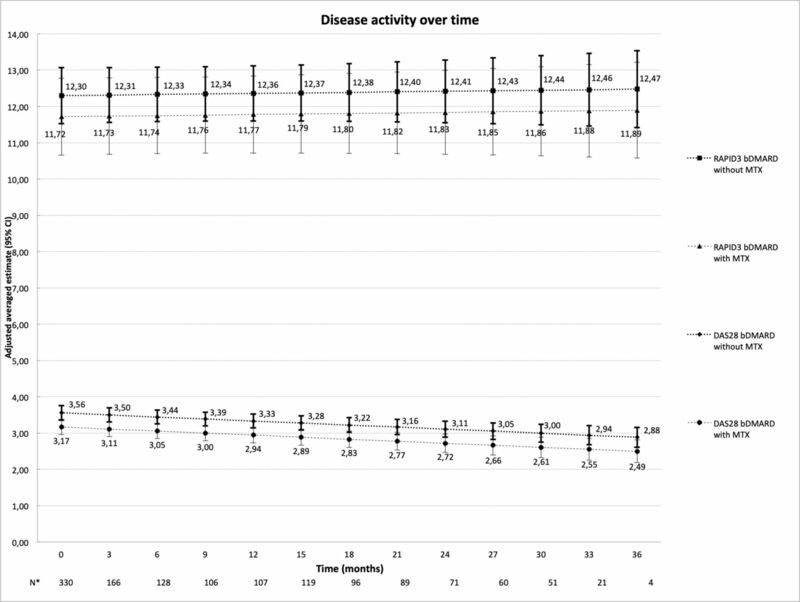 Overall, the adjusted estimates of the mean disease activity measured by DAS28 and RAPID3 over time are depicted in figure 1. MTX use in combination with bDMARDs was associated with lower levels of DAS28 compared with bDMARD monotherapy over time. On average, patients on combination treatment over time had 0.4 unit lower DAS28 than those treated with only bDMARDs, a small, yet statistically significant, difference that persisted after adjustment for age and other confounders (table 2). This benefit of MTX comedication was also seen with regard to the likelihood of achieving DAS28 remission, which was on average 55% higher with combination treatment. When looking into DAS28 individual components, the added benefit of MTX could only be demonstrated for the SJC but not for the ESR, TJC and PGA. RAPID3, both as a continuous variable and as a binary definition of remission, was not significantly different between the two different treatment strategies (table 2). Previous observational studies assessing the possible benefits/hazards of maintaining combination therapy in RA have yielded conflicting results. Gabay et al9 have shown that on average DAS28 was lower with combination treatment compared with bDMARD monotherapy, up to 4 years of follow-up. However, the same study has also shown no meaningful differences between the two strategies on the likelihood of being in DAS28 remission. Listing et al12 have previously shown a comparable result for combination versus monotherapy in a prospective study from the German biologics registerR. Other studies are less informative due to their cross-sectional design.8 9 Our study includes several paired measurements of DAS28 and RAPID3 collected over time in the same patients, and allows a better estimation of the long-term benefit of bDMARD therapy plus MTX comedication versus bDMARD therapy alone. Of note, the positive effects of MTX comedication on disease activity measures were still present when taking into account the patients’ comorbidities, age, treatment with NSAIDs and oral glucocorticoids (ie, factors that might confound the association of interest). This finding further argues in favour of combination treatment even in more complex patients with comorbidities and long disease duration. Interestingly, the effect of combination therapy on disease activity was only detected when using DAS28, but not RAPID3. Also, when looking at the various individual components of DAS28, the positive effect was only seen on the number of swollen joints (ie, an objective measure). This finding suggests that objective clinical outcome measures have merits in demonstrating treatment effects in daily clinical practice, and that only measuring subjective, patient-reported aspects of the disease, as is done with RAPID3, does not suffice despite strong messages by advocates. Our study has some limitations worth noticing. The most important one is the expected a priori prognostic dissimilarity that may drive differences between the two strategies (confounding by indication). Among others, patients who are on MTX since they tolerate it may have better prognosis and thus better response to therapy. Tapering or discontinuation of bDMARD therapy in these patients could be considered. However, this is a common issue of all observational studies, that is, increase external validity (patients from clinical practice in whom, for example, comorbidities may have impaired cotreatment with MTX), at the cost of the internal validity (lack of random and blinded treatment allocation). Second, residual confounding cannot be completely ruled out, nevertheless after the adjustment for, arguably, the most important confounders the effect of MTX was still consistently seen in all models. In conclusion, our results show patients with RA on biological therapy who have maintained their MTX dose have lower disease activity because they have less swollen joints. We are grateful to the research nurses and medical doctors of the Zuyderland Medical Centre for seeing patients and collecting the data used in this study.
. Guidelines for ATC classification and DDD assignment. Oslo, 2013.
. Dual target strategy: a proposal to mitigate the risk of overtreatment and enhance patient satisfaction in rheumatoid arthritis. Ann Rheum Dis 2018;2018. Presented at This work was accepted at the EULAR 2018 conference as an extended abstract and for poster presentation. Contributors NWB, AS and RBML had full access to all of the data and take responsibility for data integrity and accuracy of data analysis. NWB, AS and RBML were involved in data processing and analysis. NWB, AS, RBML, PHvdK, RJ and RP were involved in the study design and writing of the manuscript. All authors contributed to the critical revising and the final approval of the manuscript. Ethics approval Zuyderland Medical Centre Medical Research Ethics Committee. Data sharing statement No additional data are available for sharing.